We're going on a bear hunt is a classic book written by Michael Rosen. This book is the Chinese version. Available in hard cover. SImplified chinese. A father takes his three children out to hunt for a bear. The family encounters many obstacles such as a river, blizzard, mud and a swamp. They overcome all the obstacles before they find the bear. This is an enjoyable book to read for both children and adults. 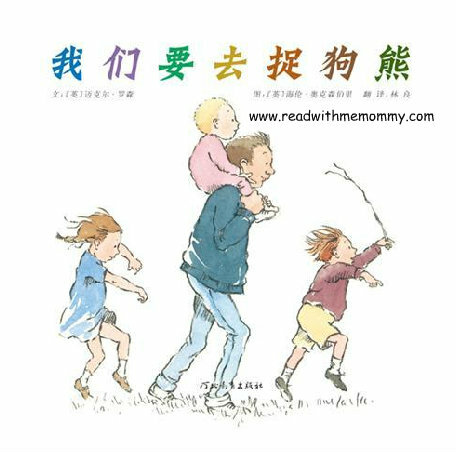 The repetitive text in the book allows the children to join in with the journey by making sounds and actions to the words and eventually learn it by memory. This book is also a good starting point for enabling the children to become aware of descriptive words during reading and writing.